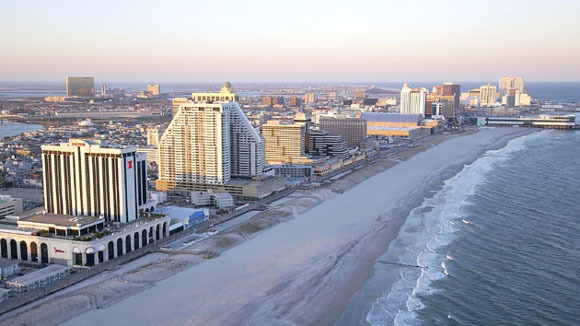 Settled in 1783, Atlantic City has a year-round population of 41,000. It is 60 miles from Philadelphia, 125 from NYC and 175 from Washington, DC. The world’s first boardwalk and salt water taffy are still there. It is also the originator of the rolling chairs as well as the Monopoly board’s street names (Atlantic, Pacific, Baltic, etc). It's prohibition-past was recently made infamous by the award-winning HBO series "Boardwak Empire". The historic Boardwalk Hall, the former home of The Miss America Pageant, has been renovated into a 13,000 seat arena for boxing, the circus, concerts etc. The Atlantic 10 basketball tournament was once held there. There are 8 casinos in Atlantic City. 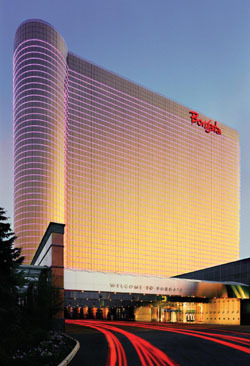 Three are located in the Marina area: The Borgata adjacent to Atlantic City’s first boutique hotel, The Water Club. 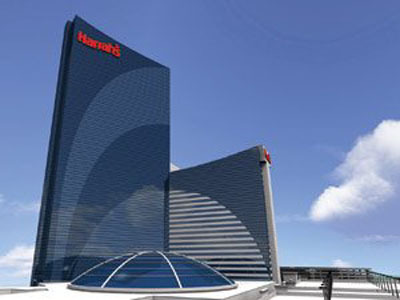 Harrah's, the tallest building in Atlantic City, boasting a “tropical paradise pool area” with 6 Jacuzzis and 12 private cabanas beneath a 90 foot glass dome, all in view of the hotel lobby. Golden Nugget is also located by the Marina. 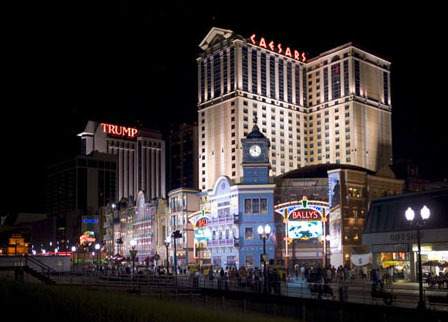 Located on the Boardwalk, the downtown hotel/casinos are: Bally’s, Resorts, Caesars (and its Pier Shops) and the largest casino hotel, the Tropicana with over 2,200 rooms. Until recently, Atlantic City was the only place that allowed gambling in the entire Northeast. But despite several new casino destinations within driving distance, there were still over 27 million visitors to Atlantic City in 2013. This article is written for those who do not spend all their time gambling. Best Rum Bar: Cuba Libre in The Quarter at the Tropicana Resort has 100 rums, and Thursday night “Late Night Latin Happy Hour” from 11PM-1AM. There is dancing, singing, conga lines and a Latin floor show. Upstairs at Cuba Libre is the open-air Missile Bar with a real (fake) Russian missile & the declassified history of the 13 Days in October (really 14 days) dealing with the Russian/Cuba/USA missile crisis. There's an interesting story of how the missle was moved from Florida to Atlantic City (right after 9/11). Best Cigar/Wine Selection: A Time For Wine is next door to both restaurants in The Quarter at the Tropicana. Great cigar selection & 100 value wines under $25. 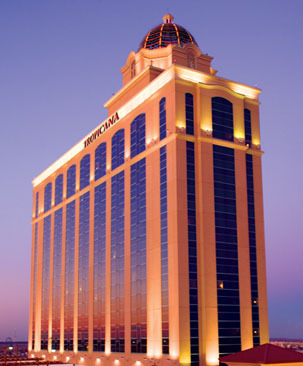 The Quarter is reminiscent of the original Tropicana Casino and Hotel in Havana, Cuba during the mid and late 1950’s. Borgata- Most of the restaurants at the Borgata have a Wine Spectator Best of Award of Excellence. Bobby Flay Steak has 512 different wines. Old Homestead steakhouse from the old Meatpacking District in NYC, has 567 wines. Wolfgang Puck American Grille has 285 wines. Palm Restaurant is a Wine Spectator Award of Excellence winner with 165 wines and 13 by the glass. Carmine's serves southern Italian favorites "family style" via NYC, with over 100 wines. Dos Caminos serves stylish Mexican cuisine and over 100 selections of 100% blue agave tequilas. Sammy D's, a coffee shop on steroids, open 24 hours. Gallagher's Steak House, with the aged NY Strip Sirloin that made them famous in Manhattan. Guy Fieri’s Chophouse serving steaks, chops and lobsters, along with Guy’s signature dishes. Chart House for fresh seafood with waterfront views. Vic & Anthony's, an award-winning steakhouse from Houston, Texas. Gordon Ramsay Pub & Grill from the Michelin Star Chef Gordon Ramsay. Casual gastro pub serving British fare, with over 30 beers on tap. Morton's The Steakhouse is a Wine Spectator "Award of Excellence" winner with over 200 wines. Buddakan features modern Asian cuisine beautifully served in magnificent surroundings. Ruth's Chris Steakhouse with 240 wines, at the Atlantic City Outlet Center, Tanger Outlets The Walk. Now you can see that there are other things to do in Atlantic City besides gamble.